Need a 4K TV but don’t have space to put one of those behemoth sets on your wall, yet don’t want to settle for a tiddly telly either? 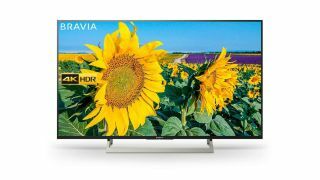 The 2018 model 49-inch Sony Bravia 4K TV and its smaller 43-inch model is the cure for what ails you. Not only will it make some of our best Cyber Monday game deals look rich and vibrant thanks to its LED backlighting and HDR tech, it also comes packed with all of the Smart TV features you could ever want to shake a remote at, including Netflix in 4K. A perfect time, then, to check out the best shows on Netflix as you head to the checkout. But be quick: this deal ends in mere hours. First up, the 49-inch set. It’s 50% off and only £549. Simply put, you’re probably not going to find a cheaper quality 4K TV at this size all Cyber Monday. Sony’s patented 4K X-Reality Pro technology, which refines every image, pixel-by-pixel, makes it a must-buy. Every bullet that whizzes past, every piece of gravel that flies up as screech around a racetrack; all of it will look extra crisp. That’s without taking into account the Triluminos game-changer. Also present on the 43-inch TV, this feature allows for greater range of colours, so don’t expect any fading, nor will the brightest, most colourful scenes look anything less than vivid and crystal-clear. Colour, clarity and, now, cheap: All told, it’s exactly what you’re looking for in a 4K set – without breaking the bank. But you haven’t got long. This deal ends at 11:59pm on November 26 and who knows how many people will snap up the stock between now and then?